As I write this, AJ Styles is celebrating his one-year anniversary as WWE Champion. 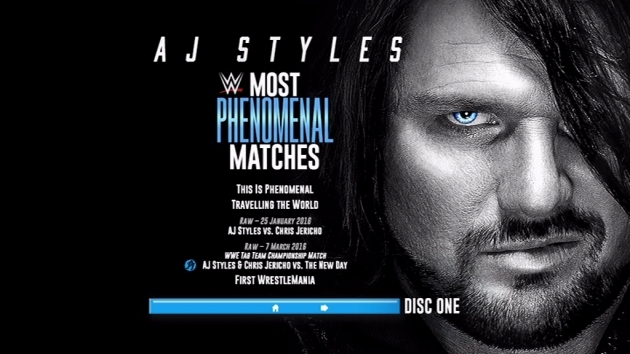 Therefore, it’s a great time to reflect upon his WWE run so far with his new DVD, “AJ Styles – Most Phenomenal Matches”. Accompanied by some insightful comments from the man himself, this DVD brings together AJ’s biggest and best WWE bouts from the last three years, covering both of his WWE Championship victories and all three of his WrestleMania appearances to date. I could finish the review right here by simply saying that it’s awesome, but I’d sooner go into further depth and briefly analyse each of the featured matches, one-by-one. So, let’s get to it! This was a good start for AJ in WWE, with him getting the clean win in a competitive match. At the time, WWE seemed to position him as someone who needed to prove that he had to belong in the company. Given his one-year WWE Championship reign, it’s safe to say that he has proven this ten times over. At another time, Y2AJ could have had an extended run as a tag team, being something of a dream team. Instead, it only existed for a little while to set up their WrestleMania clash, but at least AJ and Y2J had this underrated shot at The New Day to show for their limited time together. The crowd is well up for this, and they are rewarded with some great action. AJ wins this four-way clash, 24 hours after ‘Mania 32, to earn a WWE Championship opportunity. AJ pins Y2J with a Styles Clash to get the nod, which begs the question: why didn’t WWE have Styles pin him the previous night to further establish him as a potential title threat? The first PPV title defence of Roman Reigns’ third reign as WWE Champion came against AJ, and they rock the house at Payback, which was the first sign that Styles was portrayed as a main eventer in the eyes of the company. The multiple distractions take away from the action slightly, but it’s still a strong match. This rematch is even better, though. It’s the proverbial slobberknocker, featuring some great spots and a cool finish of Reigns spearing Styles in mid-air. Though AJ didn’t win the gold during this feud, the short-lived rivalry certainly enhanced Styles’ reputation within the company, as evidenced by his next rivalry. Three weeks after SummerSlam, Styles dethroned Dean Ambrose to win the WWE Championship (the first time this match has been released on DVD, incidentally). It’s a great main event, arguably Ambrose’s best singles effort in WWE to date. In a moment that seemed surreal to those who remembered a time when AJ even being signed by WWE was a pipe dream, Styles pinned Dean to become the new WWE Champion. Their TLC rematch is a forgotten gem. It’s possible that the interference of James Ellsworth at the finish is the reason why this one isn’t remembered so fondly, but both men put in a tremendous amount of effort before the finish, and it’s further evidence as to why 2016 belonged to The Phenomenal One. Soon afterwards, John Cena returned to SmackDown and – well he didn’t really earn a WWE Championship opportunity, he sort of just got it. Nevertheless, their Royal Rumble battle is another classic match, arguably even better than their previous bout at SummerSlam. In front of 52,000 fans, this stands as one of AJ’s biggest WWE moments, despite him losing the title to Cena here. Cena’s title reign only lasted two weeks, with Bray Wyatt capturing the gold at Elimination Chamber. This led to a memorable three-way match two days later, with Wyatt, Cena and AJ having a hell of a TV main event. Bray pins Cena to retain here, but AJ still didn’t get his singles rematch for the WWE Title, which would ultimately set up his next feud for WrestleMania. There were plenty of groans when word came out that it would be AJ vs. Shane at WrestleMania (even Corey Graves said he wouldn’t be excited to see it). But the two ended up stealing the show on the biggest night of the year with a thrilling encounter; it’s Shane’s best match ever from a wrestling standpoint, and making the boss’s son look so good was another feather in the cap for Styles. Having turned heel to kickstart his feud with Cena at the end of May, AJ turned back babyface right after ‘Mania, and soon turned his attention to Kevin Owens and his United States Championship. Styles would earn one such opportunity by winning this forgotten three-way, beating Sami and Baron in a match that is still worth checking out. 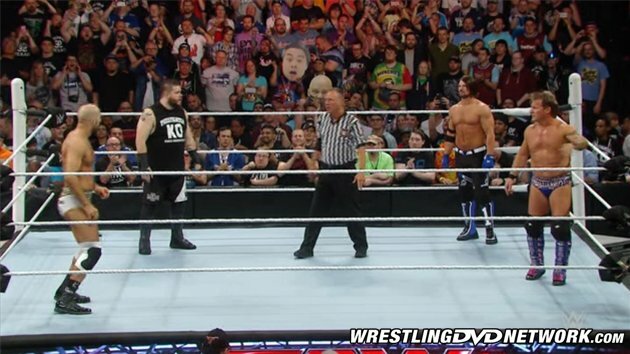 During the AJ/KO rivalry, Styles would capture the title from Owens at a house show in Madison Square Garden in July of 2017. At the time, it was said that the full match would eventually be shown on an AJ DVD, yet we don’t get the bout in its entirety here. That’s a head-scratcher, but we do get a hidden gem of an AJ/Chad Gable match from SmackDown a few days earlier, which is also a reminder of the potential that Gable has as a singles act. Though the feud had great potential on paper, the Styles/Owens conflict didn’t really match expectations, with some surprisingly disappointing bouts. We did get this moment, though: it’s yet another three-way, as AJ, KO and Chris Jericho (dropping in for the night) put on quite the show as AJ regained the U.S. gold that Owens had won two nights earlier at Battleground. Once Baron Corbin lifted the U.S. Title, AJ switched his attention back to the WWE Championship. His title win over the highly unpopular Jinder Mahal was a major moment, and a very good match (Jinder’s best by a mile). It was historic for UK fans, and it arguably stands as AJ’s finest hour in a WWE setting. One year on, he is still WWE Champion, and as things stand, his reign may continue for some time yet. Less than two weeks after dethroning The Maharaja, AJ put on a great performance against Brock Lesnar, extracting from him The Beast’s best match for a long time. With Brock/Styles II planned for this year’s Survivors, it’s cool to look back on this first battle between the two top titleholders, and it’s interesting to consider whether WWE will have the gumption to put AJ over Lesnar this Sunday. This was hyped up as being potentially one of the best WrestleMania matches of all-time. But while the action is of a high calibre, it doesn’t quite reach the expectations that so many fans had. It also ends abruptly with a Styles Clash to counter a Kinshasa, just as things were really heating up. Shinsuke’s shocking post-match heel turn is the real story here, and it’s still definitely worth a look. It just isn’t quite the barn-burner that people had hoped for. The same could be said about their subsequent bouts at Greatest Royal Rumble and Backlash. Thankfully, this Last Man Standing clash at Money in the Bank ends their feud on a high, and while it follows the standard LMS formula, there are some unique spots thrown in to ensure that this match leaves a lasting impression on fans. 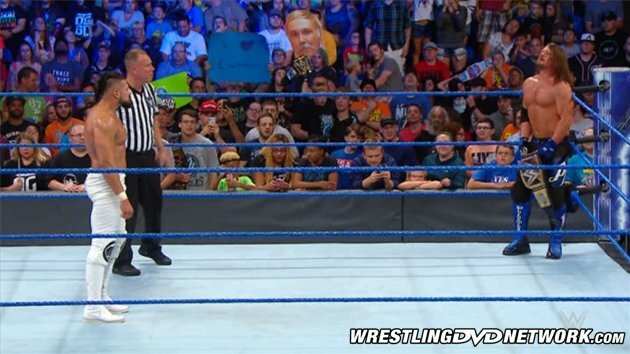 We end with a bit of a random match choice in the form of AJ vs. Andrade from a regular episode of SmackDown. Yet again, the action is top-drawer, and while I don’t see this happening just yet, I’m hoping that sometime in 2019, we get an extended feud between Styles and Almas, because based on this encounter, it could be classic stuff. Match compilations for current stars don’t come much better than this. AJ Styles has been a breath of fresh air for the WWE product, virtually guaranteeing a good-to-great match on a nightly basis, and he has featured in some of the best WWE bouts over the past three years. Despite now being 41, AJ could be a part of WWE for a long time to come, which means plenty more fantastic clashes in the future (will we finally get that AJ vs. Shawn Michaels dream match in 2019?). 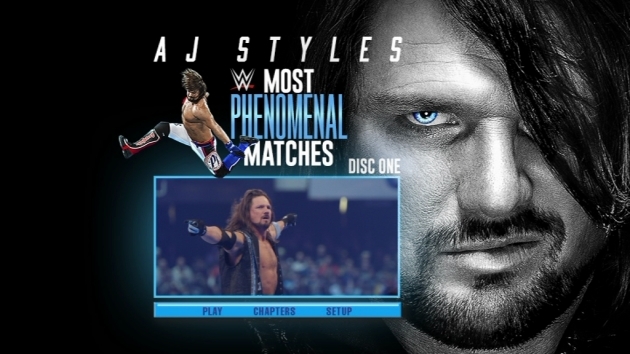 “AJ Styles – Most Phenomenal Matches” will, I’m sure, be purchased by AJ Styles fans anyway, but any WWE fan will really enjoy this, and it’s the best WWE DVD that I’ve seen on a full-time performer for a very long time. – UK/Europe: RIGHT NOW! Get the new AJ Styles WWE DVD now on Amazon.co.uk. – United States: RIGHT NOW! 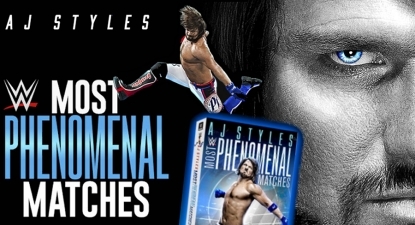 Get the new AJ Styles WWE DVD now here on Amazon.com. – Australia: December 19th. Your pre-order opportunity just went live at Madman.com.au.